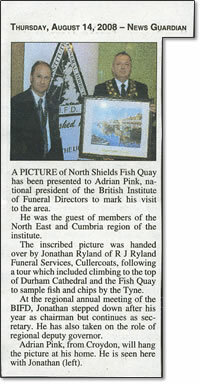 A picture of North Shields Fish Quay has been presented to Adrian Pink, national president of the British Institute of Funeral Directors to mark his visit to the area. He was the guest of members of the North East and Cumbria region of the institute. The inscribed picture was handed over by jonathan Ryland of R J Ryland Funeral Services, Cullercoats, following a tour which included climbing to the top of Durham Catherdral and the Fish Quay to sample fish and chips by the Tyne. At the regional annual meeting of the BIFD, Jonathan stepped down after his year as chairman but continues as secretary. He has also taken on the role of regional deputy governor. Adrian Pink, from Croydon, will hang the picture at his home. He is seen here with Jonathan (left).